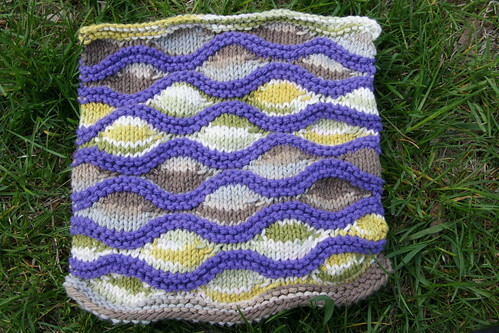 Knitting Sandwich: is it too soon for more dishcloth talk? is it too soon for more dishcloth talk? i feel like i have done my best to shield you from my dishcloth obsession (since you've been so patient with me in the past). 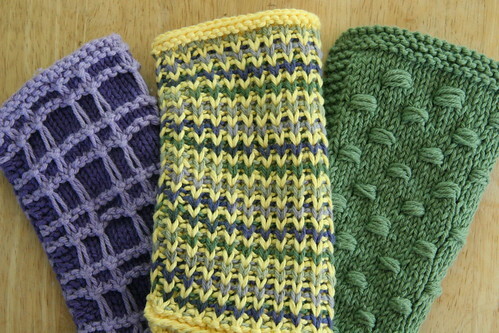 it's been a while since i've posted about how much i love knitting dishcloths (because you know it's a lot, right?). i've been trying to spare you the gory details (honestly, i've been holding back. you know each of these guys deserves it own post, don't you?). so in that vein, i will give you the "dishcloth overview" also entitled, "what melissa has been doing with worsted-weight cotton yarn for the past few months." a lizard ridge, for the dishcloths-r-us may kal. these were for my mom for mother's day. a playful plaid, tweedish and hobnail. a harmonic mosaic, for the june swap over at (you guessed it) the dishcloths-r-us forum. 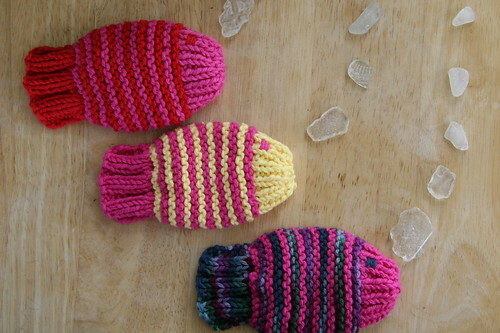 three little wishy-washy fishy tawashies for lily. 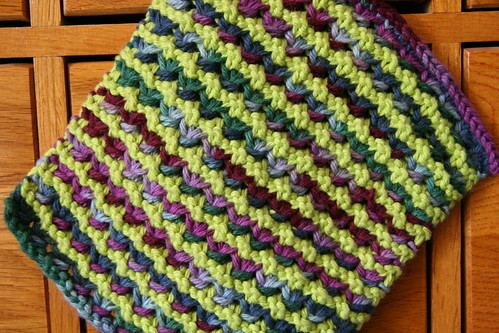 a waffle cloth, for the dishcloths-r-us july kal. 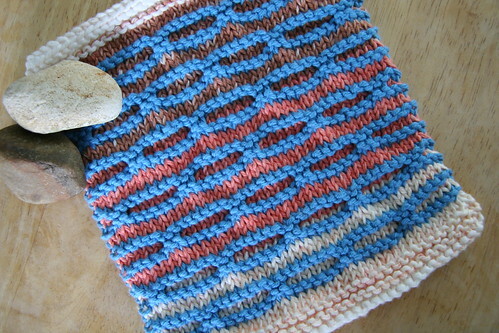 and finally a cotton dishrag/washcloth for the august kal. phew. i feel so much better, getting all that off my chest - i'd been holding it in for so long! can i just say one more time how much i love love love the dishcloths? go knit some right now!! you won't be sorry! I love your cloths... I have an entire pouch of cloths that the ends need to be sewn in and pictures taken. I love, love those cloths! The top one is marvellous, and the fishies! So cute! I love the lizard ridge and how the main yarn is just so perfect for the design. you are officially the dishcloth queen!! :) they are all so lovely! 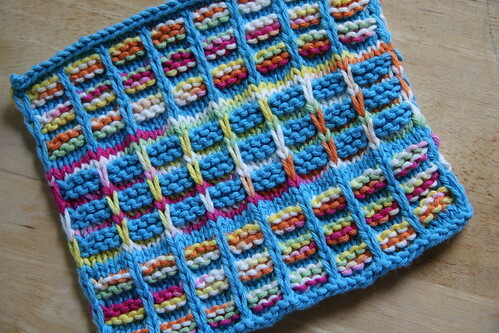 woo hoo for dishcloth extravaganza! perhaps we should knit up a dishcloth crown for your queendom? they're all gorgeous! My goodness what wonderful talent you have! 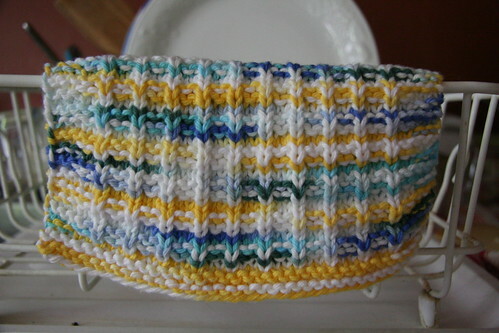 you are the dish cloth queen...these are so pretty!